Tolerance at all levels of complexity in the brain involves "learning" in the sense of the acquisition of compensatory adaptations to the consequences of the presence of a drug-produced disturbance in function. Depending on the function, species, and dose of cannabis, "tissue tolerance," behaviorally augmented (to provide the presence of the disturbed function) or not, develops at different rates or not all (e.g., to impairment of the logical sequence of thoughts, to which no tolerance has yet been demonstrated). "Dispositional tolerance" (increased rate of metabolism of delta 9-THC due to enzyme induction) may play a role in the development of tolerance or "reverse tolerance" to cannabis in man. Video - Does Marijuana Tolerance Rise? 2012 - Study ~ Role of GLT-1 transporter activation in prevention of cannabinoid tolerance by the β-lactam antibiotic, ceftriaxone, in mice. 2011 - Study ~ Role of GLT-1 transporter activation in prevention of cannabinoid tolerance by the beta-lactam antibiotic, ceftriaxone, in mice. 2011 - Study ~ Neurophysiological functioning of occasional and heavy cannabis users during THC intoxication. 2011 - Study ~ Tolerance to chronic delta-9-tetrahydrocannabinol (Δ⁹-THC) in rhesus macaques infected with simian immunodeficiency virus. 2011 - Study ~ Chronic Δ⁹-tetrahydrocannabinol treatment in rhesus monkeys: differential tolerance and cross-tolerance among cannabinoids. 2011 - Study ~ The schizophrenia susceptibility gene neuregulin 1 modulates tolerance to the effects of cannabinoids. 2010 - Study ~ Efficacy and tolerability of high-dose dronabinol maintenance in HIV-positive marijuana smokers: a controlled laboratory study. 1993 - Study ~ Cross-tolerance between delta-9-tetrahydrocannabinol and the cannabimimetic agents, CP 55,940, WIN 55,212-2 and anandamide. Every time a user smokes a marijuana cigarette or ingests marijuana in some other form, THC and other chemicals enter the user's body. The chemicals make their way through the bloodstream to the brain and then to the rest of the body. The most powerful chemical in marijuana is THC (delta-9-tetrahydrocannabinol), which is primarily responsible for the "high" associated with the drug. The most common way of using marijuana is smoking. Smoking is also the most expedient way to get the THC and other chemicals into the bloodstream. 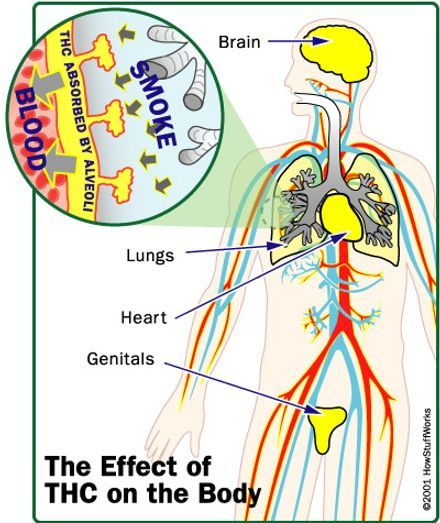 When the smoke from marijuana is inhaled, the THC goes directly to the lungs. Your lungs are lined with millions of alveoli, the tiny air sacs where gas exchange occurs. These alveoli have an enormous surface area -- 90 times greater than that of your skin -- so they make it easy for THC and other compounds to enter the body. The smoke is absorbed by the lungs just seconds after inhaling. You can also eat marijuana. In this case, the marijuana enters the stomach and the blood absorbs it there. The blood then carries it to the liver and the rest of the body. The stomach absorbs THC more slowly than the lungs. When marijuana is eaten, the levels of THC in the body are lower, but the effects last longer.